There was something that caught my eye about young Money Prince Duarte when I first saw him. 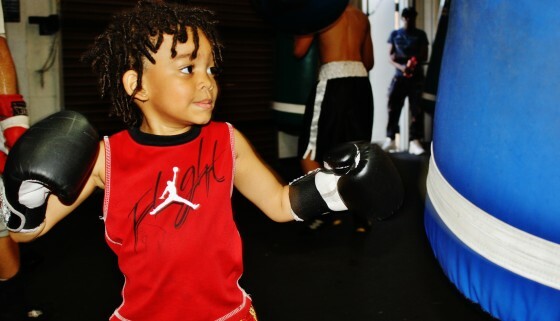 Then just three years old at the time, Prince was training inside of the Mayweather Boxing Club, as he learned some new tricks from esteemed trainer Floyd Mayweather Sr. as well as his friend Floyd “Cash Flow” Diaz. What struck me about Prince was just how fierce he was for being just a little guy. Prince’s father Marcel is an athlete himself, so it was easy for me to see where Prince got his athleticism and drive from. I have continued following Prince over the months, as it’s been great to see his progression into one of Las Vegas’ top amateurs talents. Now 5 years old, Prince has grown a lot since our early days together, but the work he has been putting in and the passion he has for the sport is still the same. What is new with Prince is that in addition to his work inside of the Mayweather Boxing Club, where he continues to train with Roger Mayweather, he also now frequents Pound 4 Pound Boxing a little bit up the street. Pound 4 Pound Boxing is one of the top amateur gyms in the world, with several top-rated champions and up-comers calling the facility home. Richad Barrientes has been working very closely with Prince on several technical aspects of the sport and the best part of Pound 4 Pound is that it is more like a family than just a gym. Being around guys like Famous J, his friend Cash Flow, as well as the Fighting Barrientes twins, Chavez and Angel, Prince is right at home with a new kind of family. It will be interesting to see what the future years hold for the young champ. Prince is at an age where he could reasonably begin light sparring sessions and I have no doubt he would be one to watch because of how fast and accurate he is already at such a young age. With Floyd Mayweather having recently announced his retirement from the sport, it’s time for a new generation of fighters to fill the void. Money Prince definitely represents a significant part of the new movement and his journey is just getting started. Please give him a follow on Instagram as well and check below for more of Prince on Hustle Boss.